Unilok tube fittings are single-ferrule compression fitting which provide leak-tight and remakeable connections in process and analytical instrumentation, control systems, utilities and other applications. Adapters: NPT, ISO/BSP, SAE/MS, AN, weld, tube stub, port connectors, and ORFS. Special fittings: Bulkhead and extended (long), bore through, positionable, calibration and dielectric fittings, silver plated nut. *Unilok tube fittings are rated to the maximum allowable pressure rating of the tubing they connect. To provide a reliable, leak-proof connections in instrumentation and process tubing systems, Unilok tube fittings consist of three precision-machined components: body, ferrule, and nut. The single ferrule design, with the spring-like action of the ferrule during make-up, compensates for the variation in tubing materials, hardness, and thickness of the tube wall to provide leak-tight connections in an extensive range of application. Through the critical interaction of the precisely machined fitting components with the process tube, a leak-tight seal is achieved. The simple geometric rotation of the Unilok nut provides the axial thrust necessary to coin the ferrule to the outside diameter of the tube. To eliminate any potential stress on an existing system, they have been designed not to transmit installation torque from the fitting to the tubing. During the rotary movement of the nut, the internal surface of the nut meets with the rear surface of the ferrule to axially move the ferrule forward into the angular section of the fitting body. The leading edge of the ferrule is directed into the tube to begin the required “bowing” action of the ferrule. Subsequently, the leading edge of the ferrule “locks” on the outside diameter of the tube to complete the sealing action and secure the tube within the fitting. The resulting “spring-like action” of the ferrule is designed to help compensate for exposure to system variables such as vibration. Unilok tube fittings are designed, manufactured, quality controlled and distributed to be totally “interchangeable”with the Parker CPI® brand of tube fittings and the components of the two brands are intermixable. The precision manufacturing of both products to stringent tolerances under rigid quality control procedures ensures the safety, performance and reliability of service whenever Parker CPI® Fitting and SSP Unilok Fitting component parts are mixed and used in accordance with published installation and service. Unilok tube fitting straight configuration are machined from type 316 stainless steel cold-finished bar stock in accordance with ASTM A-276 and ASTM A-479. Tube fitting shapes, elbows, tees and crosses, are machined from close-grained 316 stainless steel forgings in accordance with ASTM A-182. All 316 stainless steel. Unilok components are heat code traceable with certified material test reports (CMTRs) are available. Unilok tube fittings are manufactured in accordance with SSP's Quality System , which has been certified to conform to the ISO 9001:2000 Quality Standard. In addition, all Unilok tube fittings are manufactured to the technical design specifications and rigid quality control standards of the SSP Instrumentation Division. SSP's continuing commitment to quality is reflected throughout the company in its personnel, policies, equipment, products and service. 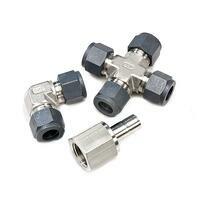 Unilok tube fittings are individually bagged to assure the highest levels of quality, safety and cleanliness. Fittings are individually bagged and packaged in small-lot quantities. Boxes are labeled with product photos, body material, and part number. Product installation instructions are included in each box. SSP and SSP distributors provide installation training courses covering tube fitting and tubing selection and installation and the proper use of swaging, cutting and bending tools. SSP offers tools and accessories to support tube fitting assembly and installation and the tubing cutting, preparations and bending. More about tool and accessories.